World Championship medallist Charles Cousins will miss the Olympics Games after having a back operation. The 27-year-old has been managing the injury for the past year but was warned he risked "irreversible damage" if he continued without surgery. He confirmed the news after missing this week's GB Rowing trials. "It wasn't an easy decision," said Cousins. "There were tears, sleepless nights contemplating everything. But in the end I did what needed to be done." Cousins, who was in the boat that finished fifth at London 2012 and was fourth at least year's World Championships, believes a medal remains in reach for the quad in Brazil. "I am devastated that I will not compete at Rio," he added. "Although I won't be in the boat, I truly believe the quad will go on to do great things and I take solace in knowing I was part of it." 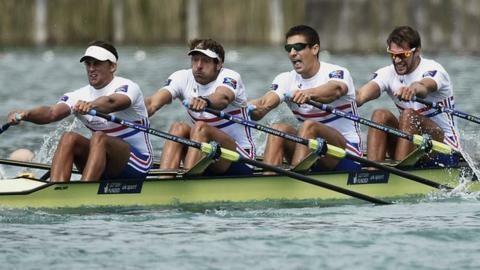 Another British rower, James Foad, announced in January that he will miss the Games after undergoing back surgery. Can anyone beat Glover & Stanning?